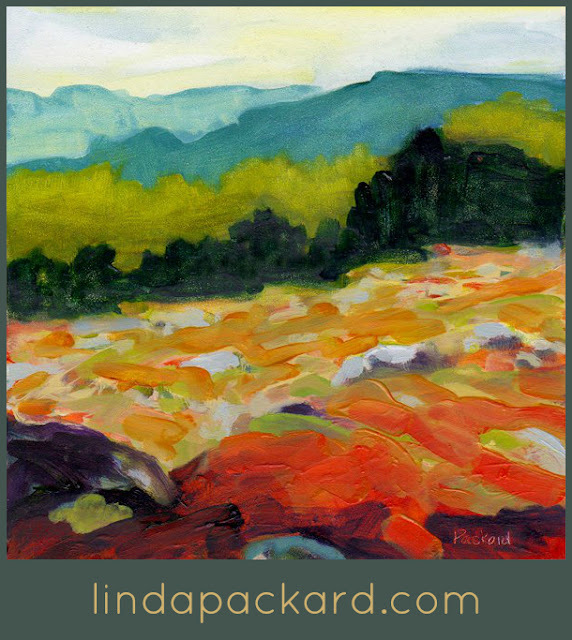 Linda Packard's use of color is astounding. I found her work via Facebook when my sister Karen, a photographer, commented on one of Linda's works. Linda not only makes art, she sometimes teaches art workshops locally. I asked Linda if I could share this painting, because I love it so much. You can see more of Linda's work at her website. So grateful, Dixie. With all the annoyances of FB, it's connections like ours that makes it worthwhile. BTW...John Wooden (quote below) is my son's hero. Fun to see that familiar quote in an art context. Dixie Linda's work is beautiful. As you know I love the color! Thanks for sharing. I am going to check out more of her paintings. Linda your work strikes a chord in me! Happy New Year!